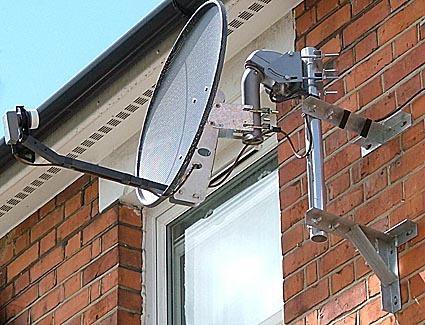 You can arrange your new system through us, we will carry out the installation to the highest of standards and wherever possible locate the dish in an unobtrusive location. We can also enable the distribution of the Sky output to other rooms and arrange that you can change the channels in a secondary location, using the global tvlink. We can install to communal satellite systems in apartment blocks, where Sky will not. If you have difficulties receiving digitqal TV via your aerial, then Freesat is a good alternative, offering the main public service channels via a satellite dish and inexpensive digital satellite receiver. 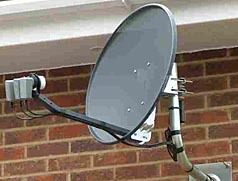 This service operates from the same group of satellites as Sky digital, so can use a similar dish size, please call for information. Missing the non free to air F1 races? If you live in a sensitive area where dishes are frowned upon, we can in many cases provide a camouflaged dish or site the dish where it is invisible to the outside world. Download available. Many people are interested in receiving programming from the continent, particularly if they are expatriate workers, or language students. 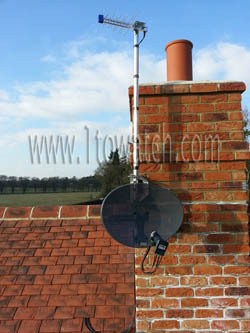 There are a number of options available, whether they be analogue and or digital, multi LNB as shown above, or a small to medium sized DiseqC motorized system as shown below, call us to discuss your requirements we are a motorised dish installer, we can provide a complete system tailored to your needs, with a choice of satellite receivers and dish types. Currently, there are channels available free to air with a reasonable sized dish for the following languages: German, French, Italian, Spanish, Portuguese, Albanian, Romanian, Russian, Ukrainian, most Scandinavian, Polish, Arabic, Persian, Farsi, Pakistani, Indian, Greek, Turkish, Chinese, and Thai. With slightly larger dish, 1 metre to 1.2 metre, Czech and Slovak channels can be received, but be aware that any dish over 1 metre, will require planning consent. We use high quality Webro WF100 Foam Filled and double screened copper core cable on all single feed satellite installations and will use the colour which most closely coordinates with your wall, or at the very least, try and find a low visibility route for the cable, so the choice is not Black or Black. For Sky installations we will on occasions use Sky approved twin mini cable for neatness.